Lake Spider Netting enables you to spend more time using your boat, than cleaning your boat. We offer the highest quality spider net material, designed to catch all the unwanted droppings from bothersome spiders, bugs, and birds. Protects from insects and bird. No more cleaning! We have a product that will make things at the lake a lot easier, and more enjoyable. No one likes cleaning the boat especially the spider bug and bird droppings. With lake spider netting, you can control that. 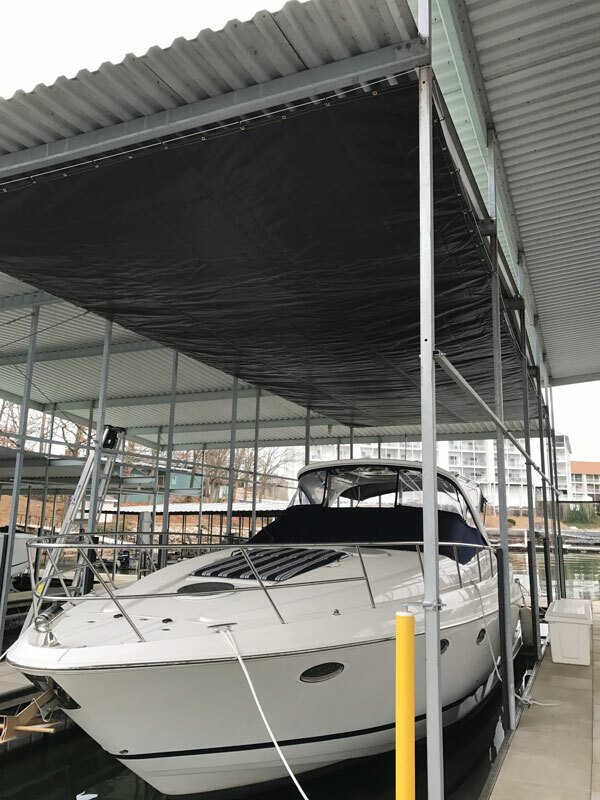 It is installed just under your dock roofing up out of the way, you never have to bother with it. This is a dependable product made of polypropylene. It is durable, tough, and long lasting. It is also very affordable. We have been installing them all over the lake. To see a demo net, stop by Bridgeport marine or contact us. We can let you know where you can see one. All of our spider nettings are custom made, to fit your boat dock. We live and boat here, so we know the problems with nasty cobwebs and unwanted droppings on your boat.